The weather had been mild since the frost of Tuesday morning, I thought that the tench might just start moving on the lakes at Great Somerford, and perhaps the perch would be big and fat ready to spawn. I had some terrible maggots that I needed to use before they all turned. It wasn’t going to be a serious session just a relaxing day by the lake. I got to the lake at about 10am and setup two Fox duo light ledger rods with 30g feeders and a size 18 hook 3 inches long on a helicopter rig similar to the ones I’ve been using on Willow lake for the big roach. I was also catapulting out a small amount of hemp to see if I could send a scent trail for the fish to pickup on. The Moor lake that I was fishing was the clearest I had ever seen it. I was not being reassured by this. By 1.30pm and not so much as a touch I walked to the trout lake Broadfield where we can fish for the roach and rudd until the last week of March. The water had an algae bloom and looked quite good. Steve one of the owners was there so I made a coffee in the fishing summer house there and we talked for about an hour. He was saying that some crucian carp had been stocked together with some smaller carp into the two coarse lakes. This is good news as true crucian carp fishing is difficult to come by. Hopefully these will grow on and reach a good size. On my way back for the tackle and the move I phoned Ivor to say where I was. He said he would come and visit me later in the afternoon. In the meantime he asked me if I had seen his large chub caught from the Somerfords stretch. He had one of 5lbs 8oz which is by far the largest chub that I’ve seen from our waters for ages in fact since I joined 25 years ago. 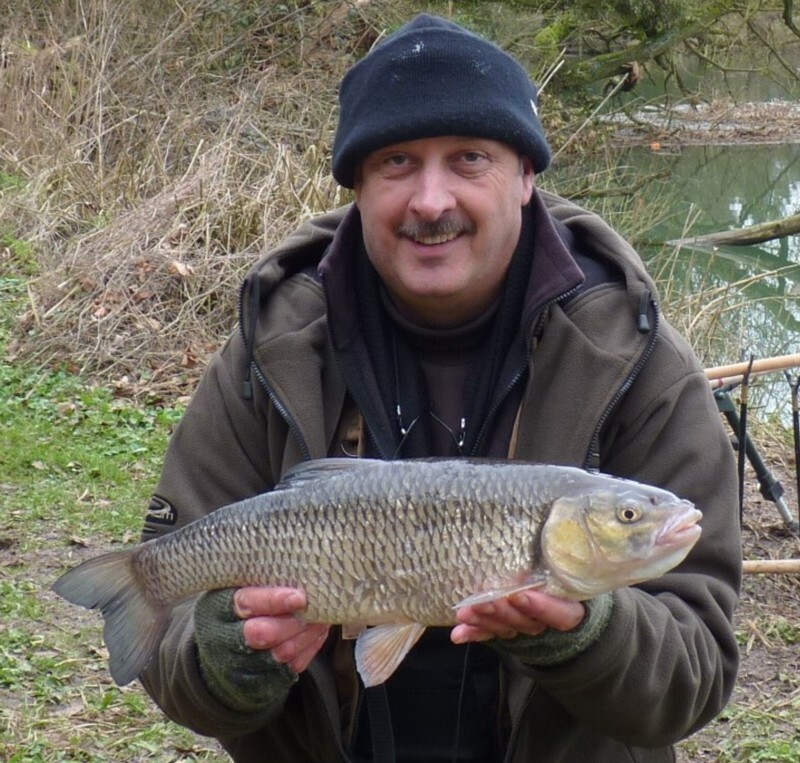 So I had to put this on the site, well done Ivor a great chub. Any how I moved my tackle into the car and drove to the other car park at the Broadfield lake and got chatting again to Ken who was fly fishing for the trout and had been very successful. Time was drifting away and the rudd were topping as were the big swirls from the trout. Ivor arrived and we continued chatting and laughing with Charlie the other owner. They all pull my leg about me fishing through the winter for the roach, but hey ho. Then Dr.Mark Everard came along to fish for the roach and said that he would like to fish the point where we were standing. It was the place where I thought about fishing but never mind there was another area which appealed to me. Mark was going waggler fish with bread. He thought the fish were in mid water. He was soon there with his gear, and it was time for me to get going, time was going fast, or it seemed to. Ivor sat with me for the afternoon. I was using exactly the same method as for the morning. Again I catapulted out some hemp and out went the feeders on top of it in about 7ft of water. Soon the indicators were flying up and down and I was landing roach and rudd of 4-6oz plus some smaller ones. Action was ridiculous at times as more often then not I was playing one fish when Ivor had to play another. Mark in the mean time was catch trout after trout, I think he caught 4 small roach between these. Ivor and I were giggling a little at Marks catches. In the end I had to ask Mark what was for tea tonight (me thinking trout). I don’t think he was best pleased as shortly after he had enough and packed up. The rudd and roach continued to feed until dusk approached then they seemed to switch off. Normally the larger fish come along but not this time. So I suppose you could call this a socialising day and very enjoyable. This entry was posted on Sunday, March 13th, 2011 at 2:17 pm	and is filed under Uncategorized. You can follow any responses to this entry through the RSS 2.0 feed. Both comments and pings are currently closed.